The light is ever changing and beautiful in the Oregon Forest where I wander through fields of Queen Anne's Lace and among the vine maple as it's turning brilliant colors. Most all of the foliage in these unique lampshades comes directly from these forests. 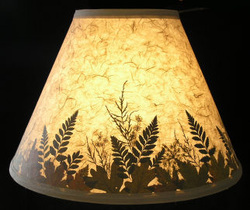 I hand gather the leaves and ferns and mix them with hand cut silhouettes. They are covered in a taupe Mulberry paper with a soft cream trim. 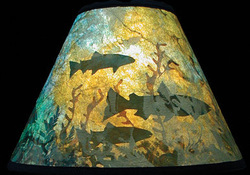 The design in the Salmon Shade is not visible when the light is off. A hand marbled paper covers this shade in hues of blue, gold, and rust. When the light is on the design is revealed! I want my love of nature to create a peaceful feeling in your home. Moose wandering through pressed leaves and ferns, covered with a taupe mulberry paper, and finished with a soft cream trim. Oregon Foliage with leaves, ferns and Queen Anne's Lace, is covered with a taupe mulberry paper and finished with a soft cream trim. This shade gives the appearance of a forest floor. 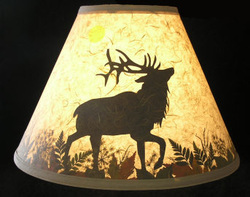 Elk walking through pressed leaves and ferns covered with a taupe mulberry paper and finished with a soft cream trim. 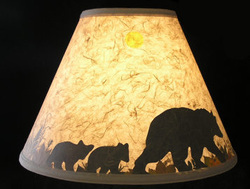 This Bear and her cubs are strolling through pressed leaves and ferns. They are covered with a taupe mulberry paper and finished with a soft cream trim. The Howling Wolf is standing on a rock surrounded by ferns and leaves. It is covered with a taupe mulberry paper and finished with a soft cream trim. 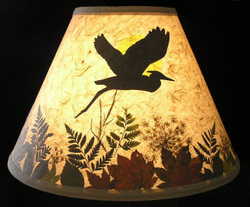 This Heron is flying over the forest floor of ferns, leaves, and Queen Anne's Lace. It is covered with a taupe mulberry paper and finished with a soft cream trim. 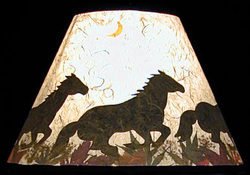 These Wild Horses are galloping through leaves and ferns. They are covered with a taupe mulberry paper and finished with a soft cream trim. The Salmon are not visible with the light off. They are covered in an Egyptian marbled paper with swirls of gold, blue, and rust colors. When the light is on it is quite spectacular! This shade is trimmed in black.